Sam and her father maintain a sanctuary for elephants. It's a hard and difficult job, but their efforts have been rewarded. The elephants they have rescued and taken care of have become a family to them and they in turn have been brought into the herd. Between the costs of running the place and the time it takes, they have plenty of worries. All of this takes a back seat when a new baby is born, and she turns out to be a very special new addition. One of their financial backers takes a special interest in the baby and the trouble starts. 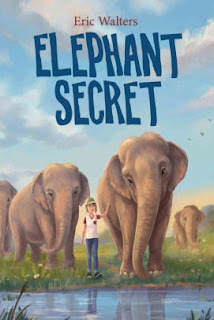 While the "secret" that gives the book its title and its conflict is a bit over-the-top, the story itself is a lovely description of elephant behavior and Sam's growing skill at managing the herd. A nice subplot involving Sam warming to her father's girlfriend allows Sam to develop emotionally as well. Walters could well have stopped there. There's plenty of conflict to drive the story already (a new bull elephant they have rescued and, of course, the challenges of raising a baby animal that weighs more than you! ), but he wants to do something more with the story. That seems silly and younger readers will just delight in the animals.